I would like to introduce you to a new line of yarn from Ice - "Nancy'. 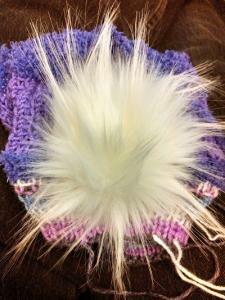 With a single skein you can make a totally unique hat - including the pom pom. I have personally used this yarn and love the results. There are no patterns available but if you use your favorite slouchy hat pattern and your imagination you will have a wonderful one-of-a-kind hat. Colors vary depending on availability. Sold only in packages of 3. (I plan to offer some in my Etsy store when I can afford to stock it). I'd be interested to see a photo of a crocheted hat made with this. How sturdy is the pompom? I'm actually having a lot of trouble finding one online (its that new). I'll make one myself as soon as I'm done with the knit one i'm working on. I guess I should make a pattern available too I will need a few days. I'll be looking forward to seeing your hats, both crochet and knit. My question about the pompom is how sturdy the pompom itself is. I'm interested because I am not at all sure I can make a pompom that will stand up to a lot of wear and tear, so a ready made pompom seems like a good idea, but it would need to be pretty sturdy. Is the yarn and pompom washable/dryable? I'd definitely hand wash cold/dry flat with this yarn. Fiber Content :10% Wool, 40% Acrylic, 35% Micro Polyamide, 15% Polyester. The pom pom feels like its made with the fluffy "fake fur" and the fibers are pretty well intact. I'm about 2/3 done the knit hat (loving how its coming out) then I'll work on a crochet one. Honestly - I will be picking a very basic slouchy hat pattern and just let the yarn "do the work" I love when its that easy haha. Because I don't know any other way to upload pictures and I wanted you to see the pom pom I just made my profile pic one of it on the hat I'm currently working on. I like those "fur" pompoms, kind of a different look from the yarn pompoms. you're welcome...and thanks for the bigger pic.